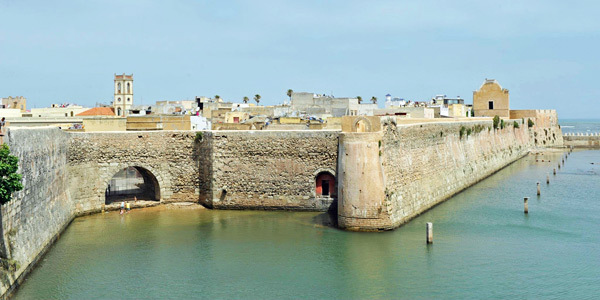 Only an hour from Casablanca airport and easily added on to stay in Marrakech (3 hours away), El Jadida is a colourful fishing port with a fascinating history. 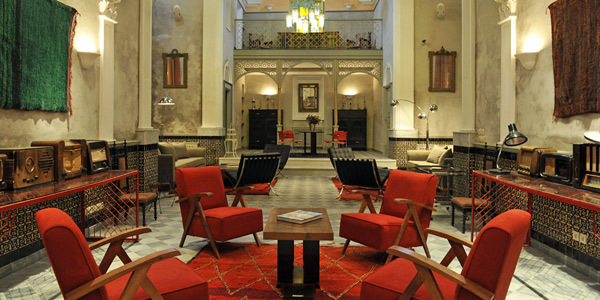 Spread across 2 buildings (the restored Portuguese church and equally elegant consulate) on the pretty harbourfront, L’Iglesia is a sublimely relaxed and unpretentious hotel with cosy rustic rooms and an excellent restaurant. However, it’s the location and surroundings (which look resplendent from the 2 huge roof terraces) that really make this place. The Unesco-listed town has an exciting history dating back to its colonisation by the Portuguese in the 1500s, and now it’s a thriving coastal destination with a strong arts scene and wonderful proximity to Morocco’s Atlantic-beaten beaches. Rooms: After the impressive and cavernous rooms of the church and consulate, you’d be forgiven for wanting something a little cosier to bed down in. Luckily the 13 individually designed rooms and suites are just that. Half-height wainscoting stacks muted greys and tans under walls of Moroccan green, pomegranate and deep maroon, and hand-woven rugs cover planked or tiled floors creating a homely and rustic ambiance. 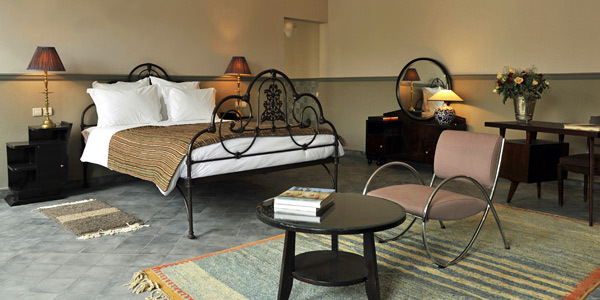 The pared down charm of the rooms is reflected in the (actually rather blissful) lack of TVs, radios or DVD players. 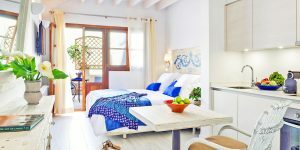 Instead, you’re treated to wrought-iron beds (some four-poster), crisp white sheets topped with embroidered covers, and Moroccan arches with shuttered windows (though there is free WiFi, air-conditioning and hairdryers). 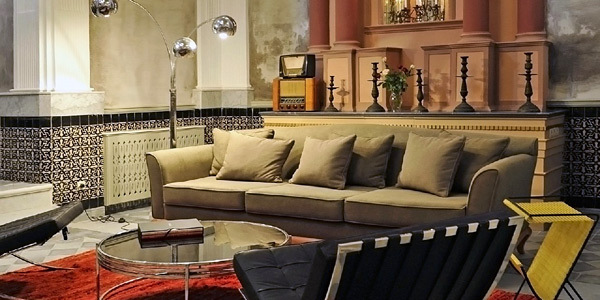 Dark wood dressers and carved armoires lend the consulate rooms (and 1 suite) an Art Deco feel, while the church’s 6 rooms and 2 suites are furnished with sleek mid-century desks and armchairs. Most rooms have ample space, but for a real treat, we suggest plumping for a Superior Luxe Room or a Suite Luxe, both of which have fantastic views. 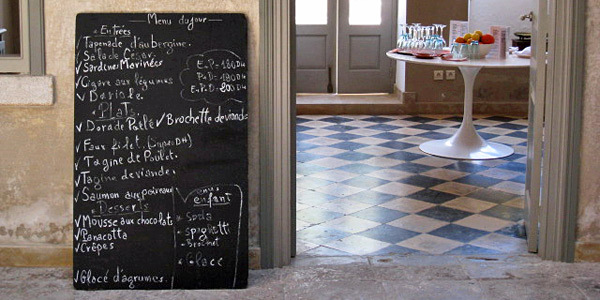 Food: The day begins simply, but deliciously, with a breakfast of yoghurt, crepes, toast, jams, juice and coffee – all enjoyed up until 10am in the consulate’s restaurant (La Terrasse de L’Iglesia), on the patio outside, or in the cloister of the church. The pretty restaurant then opens again for lunch (until 3pm) and dinner (until 9.30pm), during which time it offers a daily changing menu of Moroccan and French dishes such as aubergine tapenade, seafood, spicy vegetable stew and meaty tagines. There’s also an excellent selection of wines. If you just fancy a daytime snack, there’s always owner Jean Dominique’s rooftop tea room, Café Do Mar, where a range of teas, coffees, smoothies, crepes and ice creams can be enjoyed amongst the spectacular sweeping views. Guests can also relax with cocktails and aperitifs on the consulate’s roof terrace, or in the church cloister, where music is played each evening from 7pm. Top Tip: Arrange for Sylvie, a lecturer and expert on the history and culture of El Jadida and neighbouring Azemmour, to be your guide for an afternoon. She can give you an invaluable insight into the evolution of everything from El Jadida’s architectural styles to its multicultural heritage, which embraces Muslims, Jews and Christians.